The ice cap’s summer retreat sharply accelerated these past few weeks. Check the kink in the 2013 curve in the NSIDC’s tracking chart. It mirrors the one from 2012, though a month later. It looks a little more pronounced than last year’s to me. It’s worse than it looks. The NSIDC shifted its comparison data from the period 1979-2000 to 1981-2010, so the average and expected range are lower. If the NSIDC had stayed with the previous range, 2013’s line would already be under the second standard deviation. 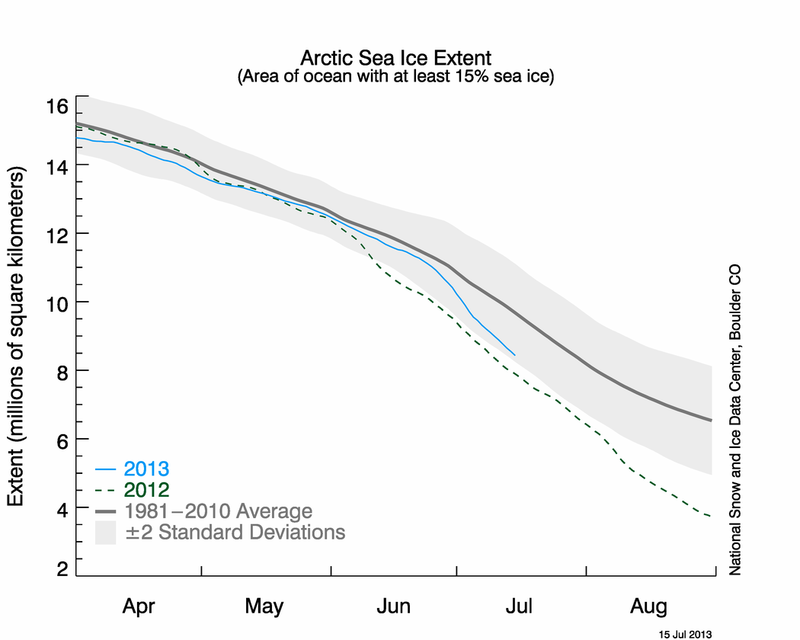 The ice cover reaches its minimum in September. The Arctic is subject to weather, just like anyplace else, and cloud cover and wind can retard or accelerate the melt. But it looks probable that 2013’s minimum will dip below the new, lower two-standard deviation mark. The 2012 number took a big southward turn in early August on its way to the record low of 1.32 million square miles. In A Change in the Weather, the ice cap reaches a minimum of 560,000 square miles in 2018, and then disappears completely in an ice-out over the course of two weeks. With CO2 at 400 ppm and climbing, I regret to say there’s nothing in the way of my literary guess coming to pass. And then, of course, things won’t be merely different, they’ll be opposite. The solid white ice will be liquid black sea, and the effect on the jet stream, already way outside its normal trajectory due to persistently elevated Arctic temperatures, is anyone’s guess. Mine is that agriculture is in deep trouble, as are we who depend on it.